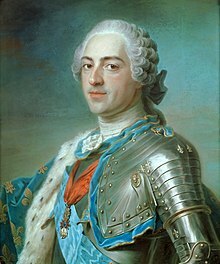 Louis XV (15 February 1710 – 10 May 1774) was a French king, who ruled from 1715 until his death. He is the great-grandson of Louis XIV whom he succeeded at age of five. He was called "The Beloved" (French: le Bien-Aimé). His failure to provide strong leadership and badly needed reforms contributed to the crisis that brought on the French Revolution. France was involved in three wars during Louis's reign. As a result of the first, the War of the Polish Succession (1733-35), France gained the province of Lorraine. The second, the War of the Austrian Succession (1740-48), which marked the beginning of a colonial struggle with Britain, was indecisive. In the last, the Seven Years' War (1756-63), France, crippled by corruption and mismanagement, lost most of its overseas possessions to the British. French foreign policy in this period was made chaotic by Louis's “secret diplomacy,” as his agents in other countries sometimes pursued aims that were in conflict with those of his own ministers. The situation improved somewhat in the 1760s, when a new minister, the duc de Choiseul, restored some order to the government and tried to repair the damage done by the Seven Years' War. In the last years of his reign, Louis cooperated with his chancellor, René de Maupeou, in an effort to reform the country's inequitable and inefficient system of taxation. In 1771 the parlements, or sovereign courts, which had opposed reform, were reorganized and stripped of their power to obstruct royal decrees. Measures were then implemented to tax the previously exempt nobility and clergy, but these were reversed after the king's death at Versailles on 10 May 1774. Louis XV died of smallpox as a defeated and unpopular king. He was succeeded by his grandson, Louis XVI, who was later guillotined during the French Revolution. Louise Élisabeth of France (14 August 1727 – 6 December 1759) married Philip, Duke of Parma and had issue. Henriette of France (14 August 1727 – 10 February 1752) died unmarried. Louise of France (28 July 1728 – 19 February 1733) died in childhood. Louis, Dauphin of France (4 September 1729 – 20 December 1765) married Infanta Maria Teresa Rafaela of Spain; had issue then married Marie Josèphe of Saxony and had issue. Philippe of France, Duke of Anjou (30 August 1730 – 17 April 1733) died in childhood. Marie Adélaïde of France (23 March 1732 – 27 February 1800) died unmarried. Victoire of France (11 May 1733 – 7 June 1799) died unmarried. Sophie of France (17 July 1734 – 3 March 1782) died unmarried. Stillborn Child (28 March 1735 – 28 March 1735). Thérèse of France (16 May 1736 – 28 September 1744) died in childhood. Louise Marie of France (5 July 1737 – 23 December 1787) was a nun. This page was last changed on 8 April 2019, at 13:16.